See the best of Chiang Mai and its finest sightseeing spots all in half a day! Very enthusiastic tour guide, the tour was a bit rushed, but we were lucky enough to go to each site at just the right time. We always missed the large throngs of visitors. They always came when we were leaving. This half day tour from Tour East is the best opportunity to get a great overview of what Chiang Mai's rich cultural heritage. You'll head to Doi Suthep, a mountain in Chiang Mai which holds one of the most beautiful temples in the city, Wat Phra Thad Doi Suthep. This temple is legendary, with a deep history and has expanded from when it was founded in 1383. From this vantage point, you'll be able to see a vast panoramic view of Chiang Mai perfect for stunning photographs. The next visit will take you to Wat Chedi Luang. The other temple visited on this tour is Wat Suan Dok whose large central stupa contains Buddha relics which supposedly self-multiplied. 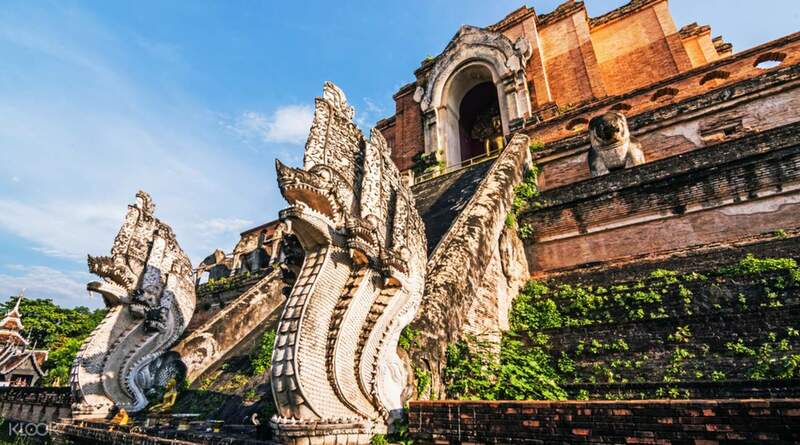 The sprawling cultural history of these temples will be described to you by your professional English speaking guide, and give you a splendid look into what Chiang Mai has to offer. Temple were beautiful as always. There was only 2 of us in the tour which made it more personal. Our tour guide Ben was very informative and always offered for take photographs of us. Views on top of Doi Suthep was unbelievable. Temple were beautiful as always. There was only 2 of us in the tour which made it more personal. Our tour guide Ben was very informative and always offered for take photographs of us. Views on top of Doi Suthep was unbelievable. Really good intro to the city and main temples, with great and comprehensive explanations of Thai history and culture. Tour guide got us in and out of main sites before the rush of other tours. Really good intro to the city and main temples, with great and comprehensive explanations of Thai history and culture. Tour guide got us in and out of main sites before the rush of other tours. It was a wonderful half day tour, our tour guide and driver are very knowledgeable and friendly. I would say this tour is worth for the money and do not hesitate to recommend anyone who want to spend few hours to explore Chiang Mai culture. It was a wonderful half day tour, our tour guide and driver are very knowledgeable and friendly. I would say this tour is worth for the money and do not hesitate to recommend anyone who want to spend few hours to explore Chiang Mai culture. Wonderful tour. This place has beautiful temples! The tour of the temple at the top of her mountain is a must-see. You can see the entire city at the top of the mountain. It's really nice. Wonderful tour. This place has beautiful temples! The tour of the temple at the top of her mountain is a must-see. You can see the entire city at the top of the mountain. It's really nice. Our guide was professional and left a message at the hotel with a pickup confirmation. The your took us to the most interesting sites. The amount of time allotted was great without feeling overwhelmed with temple visits. Our guide was professional and left a message at the hotel with a pickup confirmation. The your took us to the most interesting sites. The amount of time allotted was great without feeling overwhelmed with temple visits. The activity was fun and informative at the same time. Our guide was very knowledgeable, professional and nice. I appreciate every place we visited and i could confidently say that i will do everything all over again. Everything i paid was worth it and i have to say that our tour vehicle was very comfortable. Honestly, i was not expecting much but everything has surpased my expectations! Shout out to Tour East for giving a great service and good job Klook for making everything possible and convenient! 👏🏻👏🏻👏🏻 Highly recommended! The activity was fun and informative at the same time. Our guide was very knowledgeable, professional and nice. I appreciate every place we visited and i could confidently say that i will do everything all over again. Everything i paid was worth it and i have to say that our tour vehicle was very comfortable. Honestly, i was not expecting much but everything has surpased my expectations! Shout out to Tour East for giving a great service and good job Klook for making everything possible and convenient! 👏🏻👏🏻👏🏻 Highly recommended! We are the only two people in the group, so it’s like a private tour. The temples are nice, but feel the tour guide can talk about them a little more. Can with ac show up on time and we got two bottle of cold water which is very nice after some walking. The van kindly drop us at the Sunday night market which is perfect bc we are both hungry! We are the only two people in the group, so it’s like a private tour. The temples are nice, but feel the tour guide can talk about them a little more. Can with ac show up on time and we got two bottle of cold water which is very nice after some walking. The van kindly drop us at the Sunday night market which is perfect bc we are both hungry! 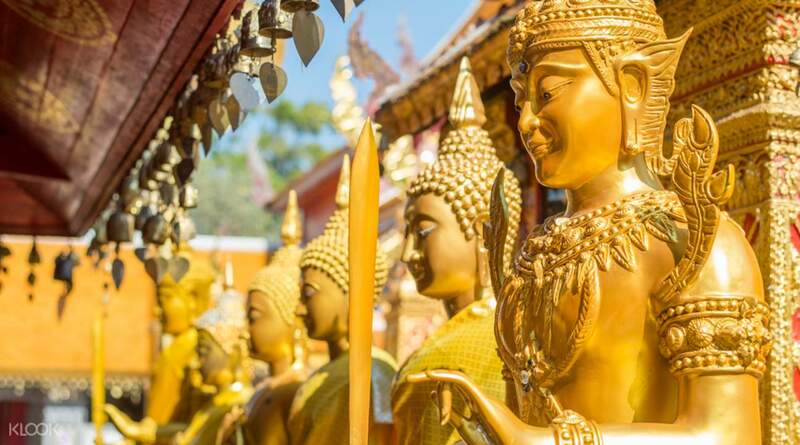 If you will be in Chiang Mai for a few days, this activity will the most convenient, easiest and cheapest way to explore the top most visited temples in Chiang Mai. Our tour guide is also informative and friendly. 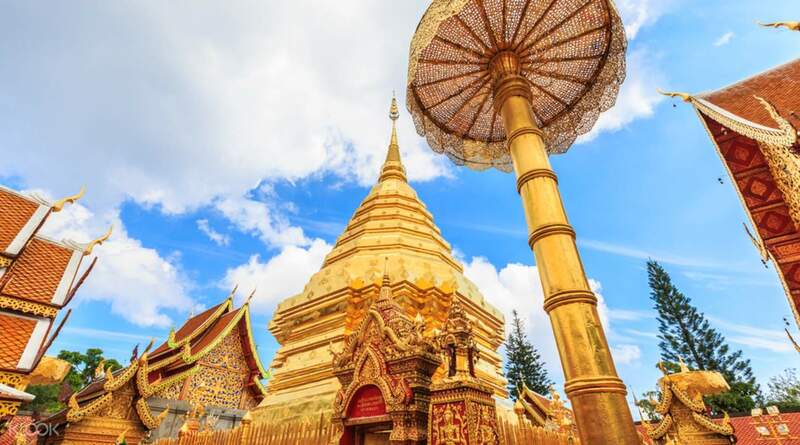 If you will be in Chiang Mai for a few days, this activity will the most convenient, easiest and cheapest way to explore the top most visited temples in Chiang Mai. Our tour guide is also informative and friendly. Oi was an excellent tour guide. We visited 3 temples and she was very knowledgable and shared not only background info and history about the temples, but also some of the rituals inside the temples. She was also great at answering questions from the tour group. Although it was only a half day tour, I got so much out of it and learned a lot. Highly recommend! Oi was an excellent tour guide. We visited 3 temples and she was very knowledgable and shared not only background info and history about the temples, but also some of the rituals inside the temples. She was also great at answering questions from the tour group. Although it was only a half day tour, I got so much out of it and learned a lot. Highly recommend!